How many sheets in a quire? How to use paper quantity converter? If you are wondering how many sheets of paper are in a ream, check out this paper quantity converter. Printing industry has their own measures of quantity - quires, reams, bundles, and bales are not the only units in which you can express the number of sheets of paper. 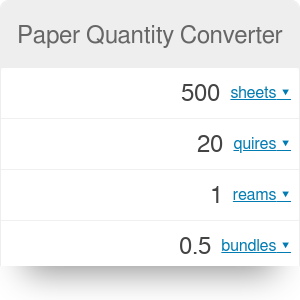 Give this converter a go or keep reading to find out more about paper quantities. Well, it depends on the type of paper you are using. The most probable is that your ream of paper consists of 500 identical sheets. Ream, sometimes called long ream: 500 sheets - international standard value, standard printing/writing paper. Short ream: 480 sheets - certain types of specialist papers may be sold in short reams, e.g., tissue, greaseproof or handmade paper. Perfect ream or Printer's ream: 516 sheets - the measure taking into account the waste incurred during paper handling and printing. Enter the value into the proper box. Assume you need to print 1000 posters. Type the value into the first box. Paper quantity converter shows the result in four different measures. We want to know how many short reams do we need, but this measure is not displayed. If the unit doesn't appear in default mode, change it by click and choose the one you need from a drop-down menu. Select the short ream. The value we were after is 2.1, so buying two short reams is not enough. Paper Quantity Converter can be embedded on your website to enrich the content you wrote and make it easier for your visitors to understand your message.